During the first few weeks of the course, we learned how to use visualization for exploring a dataset and discovering trends. Now we extend this approach by bringing in concepts from probability and statistics to build a scientific foundation for interpreting these visualizations. 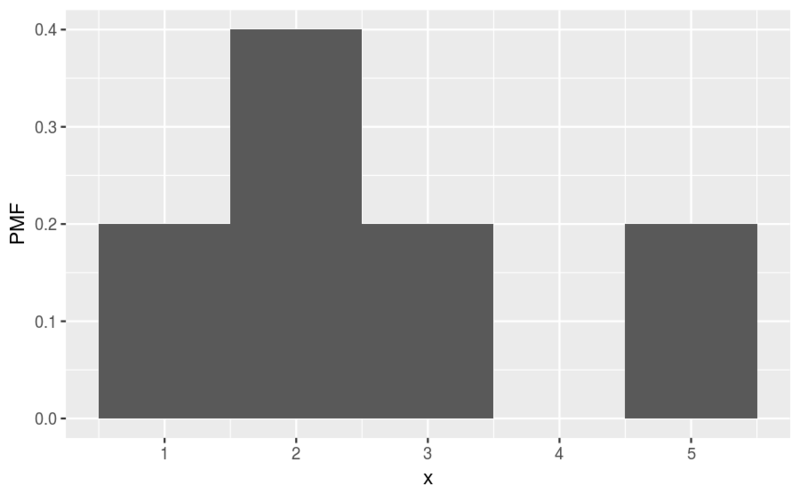 A good starting point is with how we represent univariate (single variable) distributions, which we’ve previously visualized as frequency histograms (by default, geom_histogram() sorts data into different bins and tells you how many end up in each one). 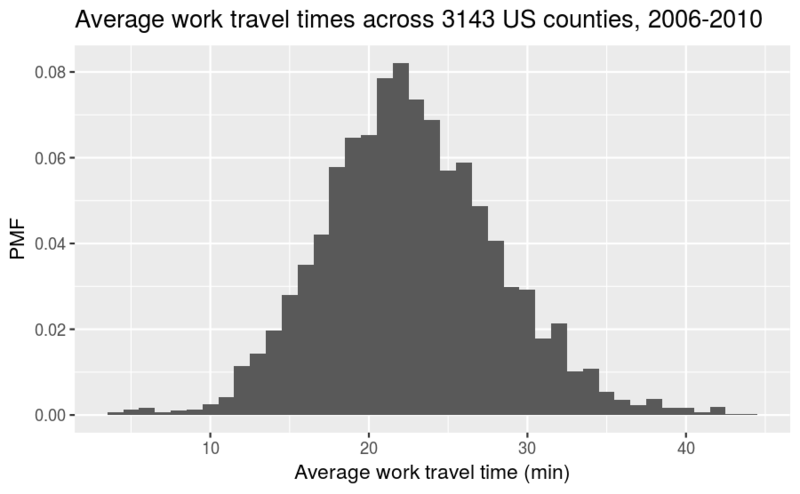 Frequency histograms are useful for examining the particulars of a single variable, but have limited utility when directly comparing distributions that contain different numbers of observations. This can occur when you group a variable into different categories or if you want to compare a variable’s distribution found in two separate experiments. We introduce two new kinds of univariate distributions that are better suited to handling these kinds of comparisons, the probability mass function (PMF), which is the subject of this part of the reading, and the cumulative distribution function (CDF), which is the subject of the subsequent reading. The probability mass function (PMF) represents a distribution by sorting the data into bins (much like the frequency histogram) and then associates a probability with each bin in the distribution. A probability is a frequency expressed as a fraction of the sample size n. Therefore we can directly convert a frequency histogram to a PMF by dividing the count in each bin by the sample size n. This process is called normalization. The relative shape stays the same, but compare the values along the vertical axis between the two figures. You’ll find that they are no longer integers and are instead probabilities. The normalization procedure (dividing by 5) guarantees that adding together the probabilities of all bins will equal 1. For this example, we find that the probability of drawing the number 1 is 0.2, drawing 2 is 0.4, drawing 3 is 0.2, drawing 4 is 0, and drawing 5 is 0.2. That is the biggest difference between a frequency histogram and a PMF, the frequency histogram maps from values to integer counters, while the PMF maps from values to fractional probabilities. 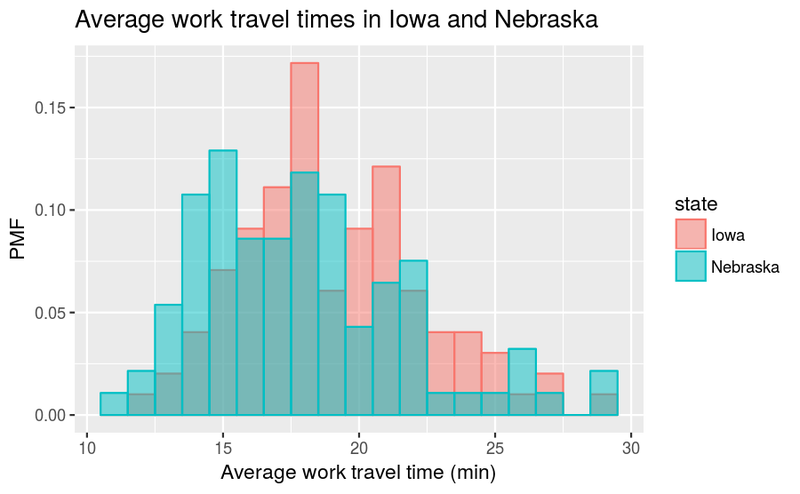 The trend that the center of the travel times in Nebraska is slightly smaller than in Iowa continues to hold even after converting to a PMF. 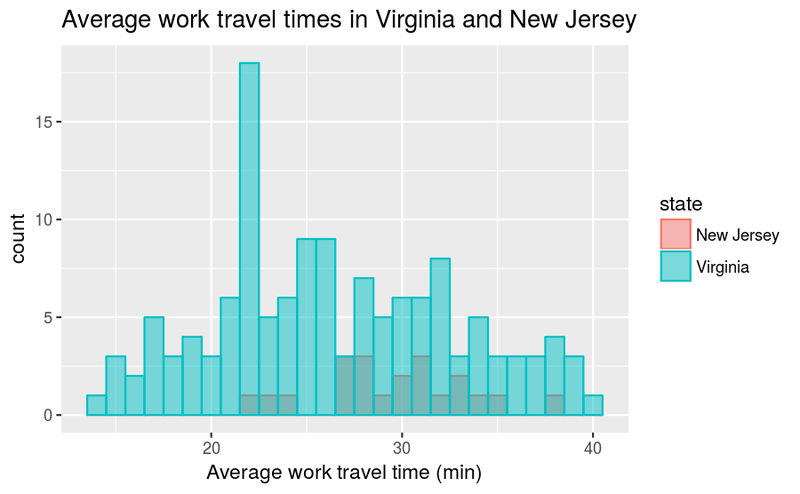 So, for example, we can now make statements like “a randomly selected resident in New Jersey is twice as likely as a randomly chosen resident in Virginia to have an average work travel time of 30 minutes.” The PMF allows for an “apples-to-apples” comparison of the average travel times. 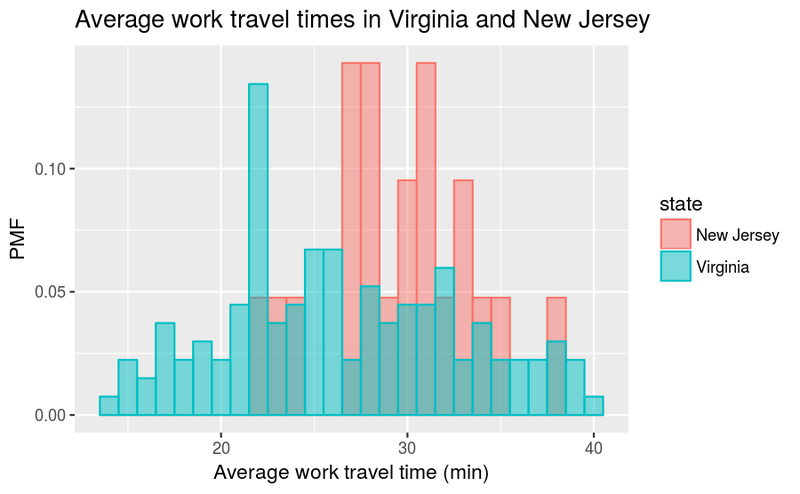 Histograms and PMFs are useful while you are exploring data and trying to identify patterns and relationships. Once you have an idea what is going on, a good next step is to design a visualization that makes the patterns you have identified as clear as possible. The one that we want to use is named data. We also append [] to the end, which extracts the data.frame that we want from the list. We then convert the data.frame to a tibble for convenience. 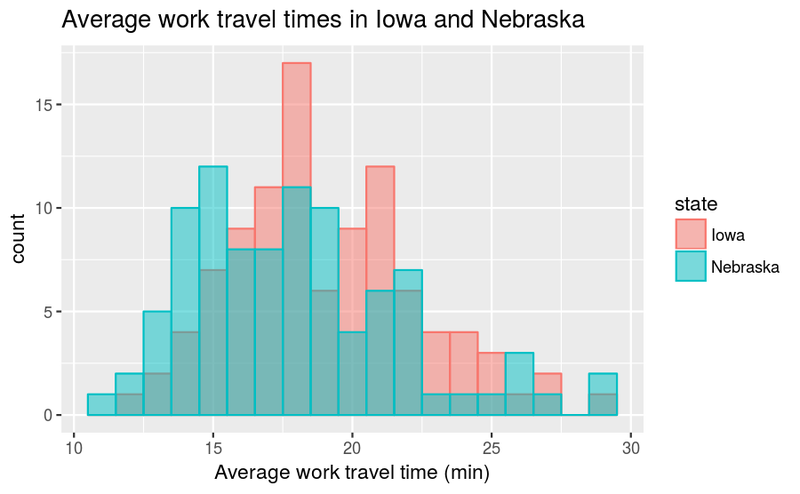 The arrows indicate that a taller bar in the \(y>0\) region means the travel time is greater in Iowa, while a taller bar in the \(y<0\) region means the travel time is greater in Nebraska. 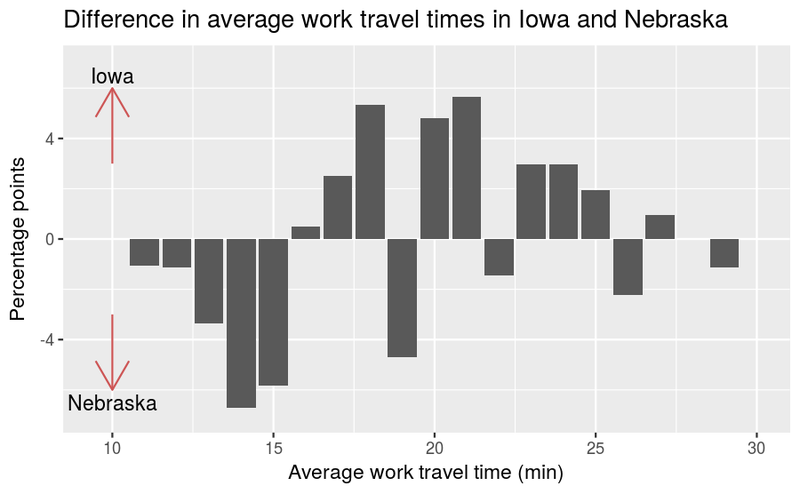 This figure makes the pattern clearer: longer work travel times are more common in Iowa than in Nebraska. For now we should hold this conclusion only tentatively. We used the same dataset to identify an apparent difference and then chose a visualization that makes the difference apparent. We can’t be sure this effect is real; it might be due to random variation. When we learn about statistical inference later on, we’ll have the tools necessary to better answer that question. Before continuing on, let’s do another PMF computation that illustrates something that we may call the “class size paradox”. Students typically take 4–5 classes per semester, but professors often teach 1 or 2. 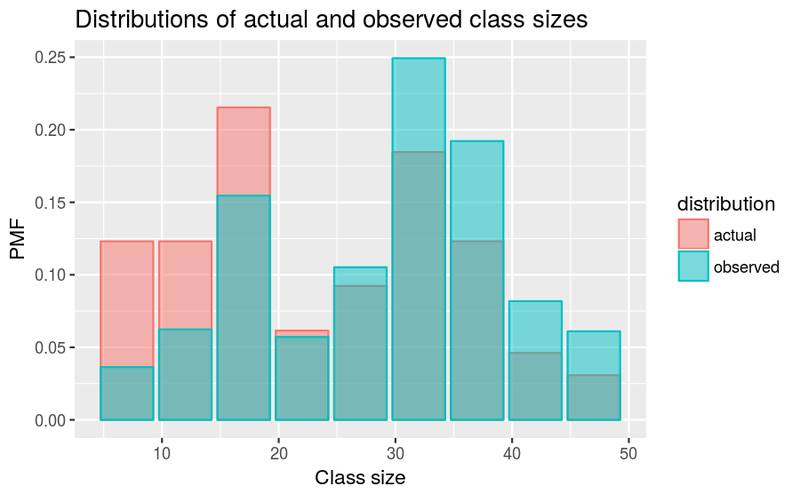 The number of students who enjoy a small class is small, but the number of students in a large class is (unsurprisingly) large. But if you survey a group of students, ask them how many students are in their classes, and compute the mean, you would think the average class was bigger. Let’s see how much bigger. which is almost 25% higher than the actual mean. It’s similar to before; the only difference is that it divides each probability by the class size instead of multiplying. This work, Probability mass functions, is a derivative of Allen B. Downey, “Chapter 3 Probability mass functions” in Think Stats: Exploratory Data Analysis, 2nd ed. (O’Reilly Media, Sebastopol, CA, 2014), used under CC BY-NC-SA 4.0. Probability mass functions is licensed under CC BY-NC-SA 4.0 by James Glasbrenner.